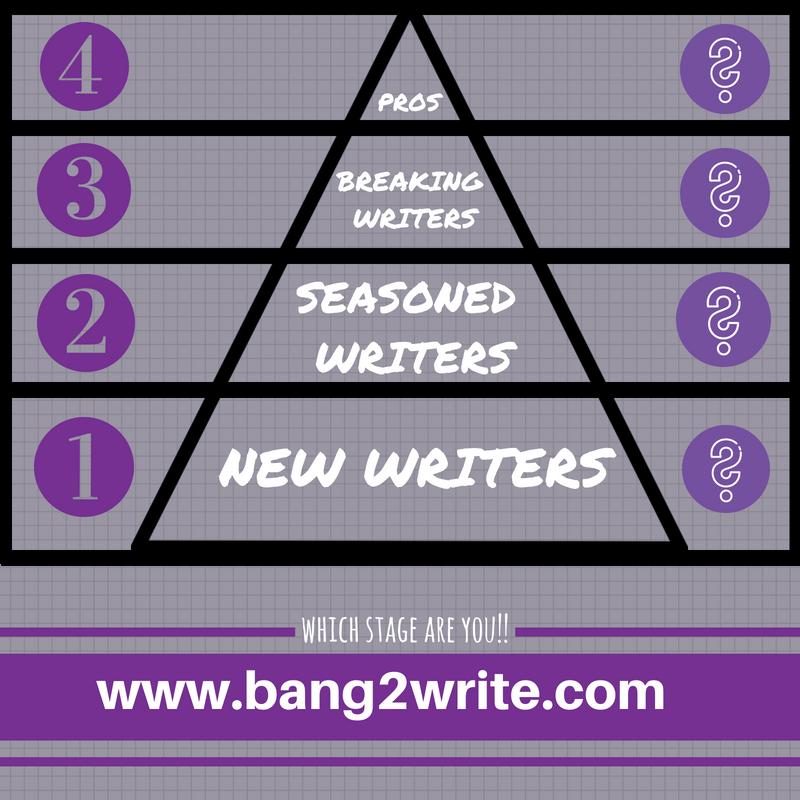 Which Stage Are You In Your Writing Career? Career writers are different to hobby writers. Whilst hobby writers write for the sake of writing (and why not! ), career writers do this AND know there are certain things they must do if they want to sell their work and carve a place for themselves in the industry. But how to do we do this, if we don’t know ‘where’ we are on the ladder? New writers are often the most idealistic, but also the most enthusiastic of us writers. Anything is possible and they’re eager to learn. They know they are at the beginning of their careers. They may have written a few drafts of a single project, or they may have written *a* draft of several projects. On the flip side, they usually completely underestimate the amount of work involved on writing craft. They may also not know much *about* writing craft. They may also have trouble visualising WHAT they need to do, or how to go about it. For this reason, many new writers will give up. IS THIS YOU? WHAT NEXT: Then make sure invest in your writing craft FIRST. Take a course, read some books, consult with your peers. The two things you should start with are character and structure. HERE’S WHY. Seasoned writers are no longer newbies. They have probably been around a good few years. They may have placed in contests or even won them; or perhaps even got a (free) option or two or had a short film made; or they may have self-published a book or have a popular social media presence or blog. That said, seasoned writers tend to be a little less optimistic than new writers. Most seasoned writers will express frustration about not advancing in their career as quickly as they would like. They may be prone to bouts of ‘is this all worth it?’, though they tend to recover quickly (especially with the aid of their peers online). Seasoned writers also tend to be the most overtly critical of produced and published works. They will be incredulous ‘such crap’ gets made or published when theirs has not. They may also profess that said produced and published content breaks ‘the rules’ of writing and that it’s ‘not fair’. Is my work ‘misfiring’ at concept / pitch level? Is my writing craft as good as I think it is? Do I know ‘enough’ about the industry and how it works? Discovering the answers to these questions will help get your writing career on track … As long as you don’t tell yourself what you want to hear! These writers have made some kind of breakthrough. This might include getting an agent, making their first sale (for actual money) and/or getting a lot of critical acclaim. In other words, eyes are on the ‘breaking’ writer and their work at last. Unfortunately this does NOT mean everything is automatic for these writers. They may be ‘on the ladder’, but they could be considered a ‘one trick pony’, or their projects may get pulled or collapse. Coming up with a name for these writers was difficult! At first I rejected ‘breaking’ (even though it has it has a pleasing notion of ‘breaking the water’) but then realised it was actually appropriate. As a script editor, I have seen this stage of the journey literally BREAK many writers. Though they are perilously close to their dream AT LAST, they will give up. The reasons for this may vary, but usually it is because the slog becomes too much. Years of being pipped at the post and rejection may just feel overwhelming. Supersadface. IS THIS YOU? WHAT NEXT: Then keep going. Do NOT give up. I know it’s hard, but it really DOES get worse before it gets better. Keep on honing your craft and keep on learning everything you can about the industry. Every ‘no’ brings you closer to a ‘yes’!! The Holy Grail of writing. Pro writers have contracts and work is EXPECTED from them, it’s not just speculative. They can make things happen with their pitches and sometimes, even just their names. Sometimes this can feel overwhelming and more than one pro writer has told me over the years they feel ‘trapped’ by their pro work! They may wish they had ‘more time’ for spec work, or to try a different medium altogether. Pro writers have also told me they feel like ‘frauds’, especially when it comes to finances. Back when they were new writers (and even beyond), they dreamed of the days they could pay ALL their bills with ‘just’ writing. But this is rare. IS THIS YOU? WHAT NEXT: When writing becomes your literal job, it’s normal to feel as if some of the joy has gone from it. Focus instead on those aspects you DO still enjoy, or even your downtime … Whatever gets you through. You would also be surprised how many pro writers you look up to have to supplement their writing incomes with day jobs, related work or teaching. Besides, being a professional is more than money. So enjoy it. What’s the alternative! So … where are you on the pyramid?